"Figurative Moments a Group Exhibition"
Trisha Lambi will be exhibiting in "Figurative Moments 08" at Art Moment Gallery in Sydney. Art Moment Gallery is located in the heart of world famous Bondi Beach and is dedicated to showcasing work from emerging, mid-career, and established artists from around the world. Figurative Moments is a group exhibition of artists� exploration of the figure. The show opens on Thursday 20 November from 6pm to 9 pm and runs until Sunday 7 December. 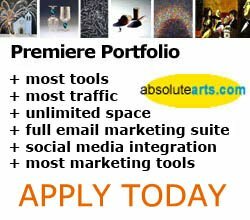 Trisha Lambi has been promoting her works with a Premiere Portfolio at absolutearts.com since 2001. Trisha Lambi comments about her work, "Light on form is my inspiration and is manifested in my work bilaterally as a figurative and landscape/seascape painter. My passion for light is explored further by examining the theory that simplicity in an image has a complex impact on the viewer. By focusing strongly on light and using a simple composition the viewer can interpret and indeed conform that image to their own individuality - complete with all the preconceptions and prejudices inherent in each person. A simple painting then becomes multilingual - the object of a complex myriad of interpretations which in turn breathes more life into that painting. "